Skyway offers its business customers Email and Domain Name Services. Hosting everything with Skyway means the best possible connection to your mail server, and peace of mind knowing that your IP address provider is also taking care of all your domain name lookups. 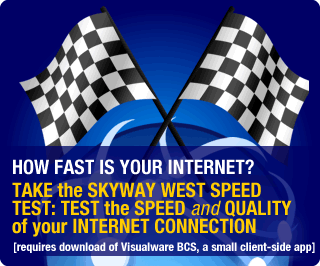 The highest availability intra-office email is that hosted locally or by Skyway. All Skyway services include free email accounts with spam and virus protection. The number of free email accounts included with each service is listed below. Additional email accounts are available for $2.50 each per month. Spam and virus protection is available for customer hosted email at $20/domain per month. All Skyway accounts include unlimited email aliases, as well as secure web access to set up and manage email accounts, including vacation messaging and virus and spam controls. Maximum attachment size 10 MB before conversion to MIME. We update our anti-virus dictionary to defend against the latest virus definitions. Our mail server currently scans for, and blocks, hundreds of thousands of viruses preventing them from reaching your users. It is important to remember, however, that any email anti-virus protection is not 100% reliable because all dictionary updates are issued after the virus is identified. Our email anti-virus protection is just the first line of defence and should be used with other anti-virus prevention tools especially since viruses are not just distributed by email. It is a simple process to register domain names online. The availability of a Canadian domain name (.ca) as well as links to trusted registrars can be found at the Canadian Internet Registration Authority (CIRA). The availability of many other domain extensions (e.g., .com, .net, .org, .us, .bz, etc.) can be checked at Network Solutions among others. If you are uncomfortable with the process of registering your domain name or transferring it to Skyway, email Skyway West and we’ll be happy to help you. Our Control Panel allows secure web access to manage Domain Names and email accounts, including reverse and forward lookups and TTL (Time to Life) parameters. Skyway West provides free domain name hosting to our customers. We charge $50/domain per year for non-Skyway customers.